We can rest easy knowing that developers are already using next-gen technology to bring dirt and grime to all new levels of fidelity. 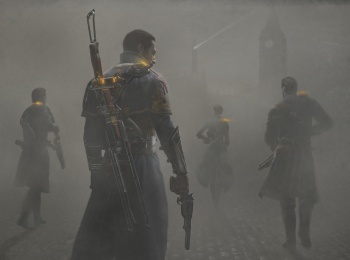 Ready at Dawn revealed their first original IP, the steampunk-style The Order: 1886, with a dramatic trailer at E3. Details since then have been scarce, but now they're marginally less scarce thanks to a recent interview with the studio's co-founder, Ru Weerasuriya. The first official comments we've heard about the game are pointing to a cinematic action-adventure experience, with a few surprises in the gameplay department. "The Order is a third person action adventure with shooting mechanics," Weerasuriva says. "It's very much story-based ... it's what we call a filmic experience." From the sound of it, the game will be mostly linear, sticking to its anachronistic guns and moving through a pre-determined plot. It's probably worth noting that Ru didn't define it as a shooter, so there could be more dialogue and exploration than chained setpieces littered with chest-high walls. The "filmic" part of the description is no joke. Weerasuriva is enthusiastic about the visual experience the team is crafting with the PS4's technology; the game's camera has "physical lenses" built into the engine to capture true lens distortion and light effects. This is in contrast to most modern games, which he thinks can break immersion with unrealistically clean images. The Order aims to simulate grit and filth on an unprecedented scale - hopefully, it'll be so realistically dirty that you'll actually believe you're in London.